The American Civil War of the 1860s is reappearing in multiple ways during the summer and fall of 2017: The classic Civil War film Gone with the Wind (1939) was removed from a popular film festival in Memphis, Tennessee. Deemed “insensitive” to the local population, which is 64% black, it was removed from the 2017 and 2018 series after a showing on Aug. 11, 2017. The statue of Robert E. Lee and other Confederate soldiers may be removed all across the South. An Asian TV announcer with the name Robert Lee was removed from his announcer post at ESPN – temporarily, as a football game Aug. 26, 2017 was to be held in Charlottesville, Virginia, the scene of the protests and counter protests in mid-August regarding Robert E. Lee’s statue. [i] And since George Washington and Thomas Jefferson were also major slave owners, the question arises: Should their statues be removed as well? And what about their images on U.S. currency? The planetary backdrop for events in summer/fall 2017 is connected in part to the unprecedented transit of Pluto in Sagittarius opposite the USA natal Sun (22:38 Gemini) within 3°. In a national chart, the Sun represents the leader or president, and in a sense – the soul of the country. Tr. Pluto opposite the USA Sun questions the authority and legitimacy of the U.S. President and from a vantage point that is all-pervasive but whose source of information may be false or not completely known, since Pluto prefers to remain unidentified or underground in some way. However, the near to exact Pluto-Sun opposition may also cause some major secrets to become known. Further background on this topic can be found here. 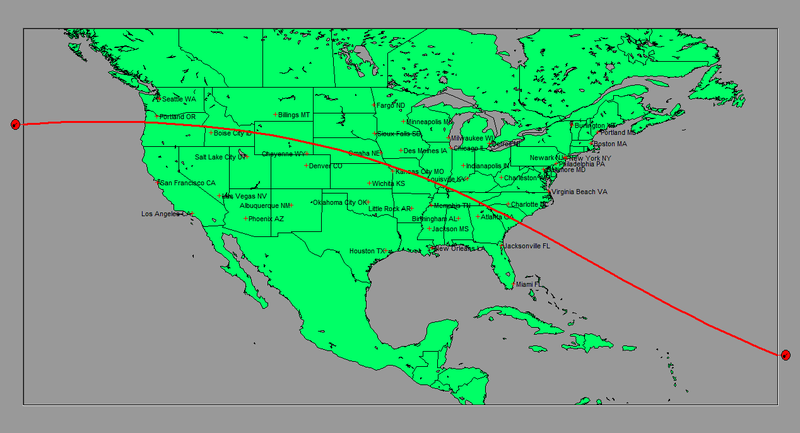 Since Pluto’s orbit is 248.4 years, we know that its first-ever opposition to the USA Sun will have a significant impact. This takes place on an axis which should be seen as the nervous system of the world – the Gemini-Sagittarius axis – where information, history, advertising and national pride meet in the world of talk, print, and visuals. Sagittarius infuses it with a focus on religion, sports and politics, and Gemini with a focus on accessibility, profitability and sexual charm in the process of attracting a wider and wider audience. Throw in some extra planetary volatility, which we will discuss shortly, and you have the potential for radically divergent views and opinions fuelling radically divergent concepts about American politics and history. Support for whichever view is not always informed so much as laden with the belief that “God is on my side.” And in this case, opinions are also sharply divided about the current elected president, with many issues tending to circle back around to this all-consuming topic. Though tr. Pluto entered sidereal Sagittarius in Feb. 2005 (for 15 ½ years up to Dec. 30, 2020, excepting Feb. 25-June 29, 2020), the intensity of its configuration opposite the USA Sun is increased when within 3° of the exact opposition. This pattern occurred for much of 2015 and 2016 and runs all through 2017 up to Jan. 2018, coming also later in 2018: August to November (i.e. continuing within 3° opposite the USA Sun). Pluto passes through Sagittarius during four U.S. Presidential primary and election seasons: 2008, 2012, 2016 and 2020. But the Pluto-Sun opposition delivered its most intense effects on American presidential politics during the last two years of the Obama presidency and the entire period of the controversial 2016 U.S. Presidential primaries and election. The close Pluto opposition-USA Sun (3°orb) began Jan. 16 to July 29, 2015, with a Pluto Stationary Retrograde at 21:29 Sagittarius on April 17, 2015. Five days earlier, on April 12, 2015 Hillary Clinton launched her presidential campaign, with other politicians declaring their candidacies within the same January to late July 2015 time-frame, including Donald Trump on June 16, 2015. It is as yet unknown what pressure President Obama (Sun) was under to bend to the wishes of secret powers (Pluto) during his last two years in office, but during the 2016 Primary and Pre-election season he and the First Lady campaigned vigorously for Hillary Clinton. More controversially and as yet mostly unchallenged, with the cooperation of liberal mainstream media (MSM), he used his presidential powers to conduct aggressive and ongoing surveillance on Republican candidate Donald Trump and many of his team, including incoming Cabinet members. Unprecedented in its scope during the course of a presidential election, this included the illegal “unmasking” of some key Republican operatives and campaign staff, i.e. surveillance which unmasks those private citizens who are supposed to be protected by U.S. privacy laws. Among the “unmasked” were Trump’s National Security Advisor Michael Flynn prior to being sworn in Jan. 20, 2017. This led to his early departure after only 24 days in office, and unfortunate for those who wanted to see more of a diplomatic approach to Russian relations. The premise for the surveillance was the belief that the Trump team was colluding with Russia to win the 2016 U.S. Presidential Election. When it remained (and continues to remain) unproven, they continued the surveillance anyway, along with perpetuating the myth that Trump won the election unfairly through Russian interference. Unknown to those only following MSM is that the Democratic National Committee never allowed the FBI, NSA, or Department of Homeland Security (DHS) to examine their servers to see if their computers were truly hacked by the Russians, as they claimed. The only group allowed to do so was Crowdstrike, a private cybersecurity firm whose close and long-term allegiance with Clinton and the DNC were well known, along with their ability to leave cyber footprints as if the Russians had done the deed. Meanwhile, the FBI, NSA and DHS never pressed for a warrant to examine the servers for themselves, and FBI Director James Comey testified several times before Congress that the FBI had never examined the DNC servers. Given that the “Russian hack” story was repeated relentlessly through MSM, and with absolutely no conclusive evidence, it suggests deep cooperation between federal law enforcement, the media and the DNC, setting the stage for an antagonistic relationship with the incoming Republican president. Other teams of highly knowledgeable experts, notably the Veteran Intelligence Professionals for Sanity (VIPS), have repeatedly shown that no hacker was involved in the lifting of DNC and Clinton campaign emails, and that for many specific technological reasons it had to be a leak by a person on the inside. Shortly thereafter, before Hurricane Harvey had even made landfall in Texas, Trump was blamed for not preparing properly for the Texas emergency. In short, he is seen by many as singlehandedly responsible for many of America’s current ills. And if you disagree with that assessment, you are as much of a racist as Trump, and probably a Nazi as well or at the very least – lacking in basic intelligence. End of story. Do we see a Civil War brewing here, aided and abetted by MSM? Anyone agreeing with ANYTHING Trump does or says is promptly vilified by Trump-haters, who in turn claim that Trump’s own personal style and policies instigate hate. The problem is that he is our legally elected president, and one who probably did receive more votes than Clinton, according to some credible sources with convincing evidence. One of them is the indefatigable and non-partisan vote fraud expert Richard Charnin, an applied mathematician. Using his own methods, he correctly predicted Trump’s win to the exact number of electoral votes, and did so with several previous elections. But with the people distracted and divided against each other, they may not see what is really happening under the surface, and MSM is not likely to help matters. 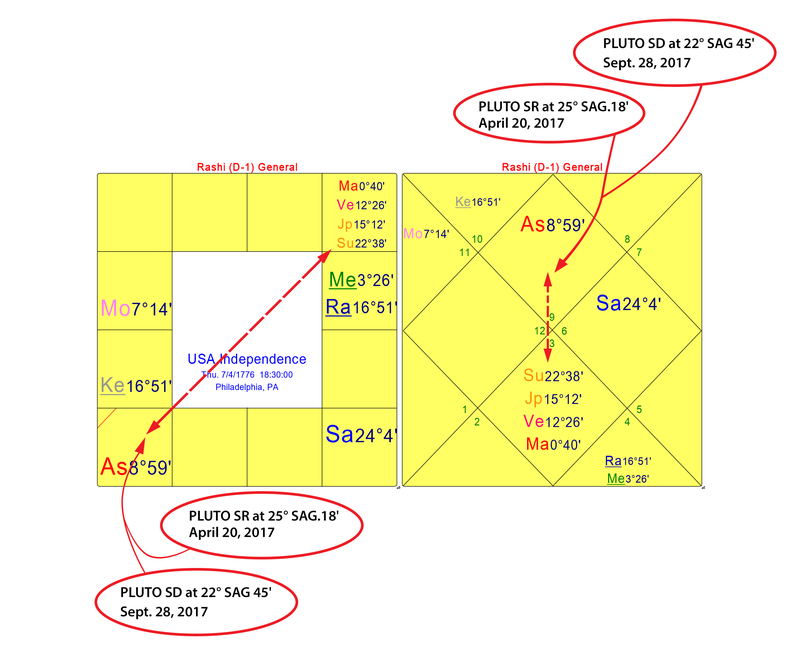 Add to this some other predominant planetary patterns for July – Sept. 2017, and we see how they present several clear indicators that life may well take some dramatic turns due to accelerating emotions, and partly due to the two differing streams of information (or misinformation) being disseminated across the U.S. and globally. This fundamentally affects what is known and who knows it, further fanning the fires of opinion-making and debate. First of all, all the classical malefic planets are acting up: Sun, Mars, Saturn, Rahu and Ketu. (Rahu and Ketu are the lunar nodes.) We know that there is always greater intensity around the eclipse months, with two eclipses in August 2017, including a Total eclipse Aug. 21st and an eclipse path exclusively across the United States, the first time since 1918. Combine this with tr. Saturn hovering in the last degrees of sidereal Scorpio June 22 – Oct. 26, 2017. In this area of the zodiac it is also gandanta, a more treacherous degree area in Vedic astrology: the last 3:20 degrees of watery signs (Cancer, Scorpio, Pisces), but especially notable in Scorpio, where Saturn is also Stationary Direct (SD) on Aug. 25, 2017 at 27:05 Scorpio. Whatever a planet in gandanta Scorpio brings, it is not how it first appears. In turn tr. Mars, ruler of Scorpio, is debilitated in Cancer conjoined with tr. Rahu (also gandanta) Aug. 17 – 26, 2017, and combust the Sun, either in watery Cancer July 16 – Aug. 16, 2017, or in fiery Leo, Aug. 16 – Sept. 16, 2017. When Mars (or any planet) is both debilitated and combust the Sun for long periods, it brings several paradoxes. Weakened in its sign of debilitation, Mars already has a tendency to overcompensate for this weakness. Similarly, a combust planet manifests itself by overcompensating for the qualities of that planet, since we tend to think they are missing or at the very least invisible to ourselves and others. This is because a planet combust the Sun cannot be seen with the naked eye since it is so close to the Sun. And since Mars has the largest combustion range, at 17°, this period lasts longer for Mars. Aug. 17: Indictment of Imran Awan and wife Hina Alvi, former U.S. Congress staffers, on four charges of bank fraud, sending money to Pakistan illegally “in an apparent attempt to escape from a broader, ongoing investigation into cybersecurity and theft issues.” (Luke Roziak, Daily Caller, Aug. 24, 2017) Imran Awan was a longtime IT aide to Debbie Wasserman-Schultz and other Congressional members, and closely connected with the Clintons and the Clinton Foundation. The FBI says Awan and his associates were selling state secrets, with an elaborate spy ring in Congress. No ongoing coverage of this is in MSM, though for many months it has dominated alternative news and sites run by citizen journalists, including George Webb and Jason Goodman and most recently their press conference at the National Press Club. Aug. 21-31: Annual war games conducted by the U.S. and South Korea, with major objections from North Korea, which continues to escalate its own nuclear missile testing program after two successful inter-ballistic missiles were launched in July 2017. The US-North Korea war of words continues, with both Trump and Kim Jong-un refusing to back down as of late August 2017. Aug. 23: Trump’s pardon of the controversial former Arizona sheriff Joe Arpaio (1993-2016), who lost his latest re-election bid due to civil and criminal contempt charges for policing policies with illegal immigrants in Arizona. Aug. 24: U.S. Senate Intelligence Authorization bill expanded to declare war on Julian Assange and Wikileaks, labeling it a “Non-State Hostile Intelligence Service,” even if Wikileaks is not an intelligence service and Assange is an Australian journalist. This criminalizes a news resource that exposes criminality inside governments, and is used by The New York Times, The Washington Post, et. al. – a red flag of a significant change in foreign policy, and further intimidating major media, who already do minimal investigative reporting. Aug. 25: House Joint Resolution 76 passed by U.S. Congress, a bill that permits warrantless searches of private citizens’ homes in the District of Columbia, Virginia and Maryland, setting a precedent for other states, and violating the 4th Constitutional Amendment. No major media coverage. Aug. 25: Dismissal of a 14-month long DNC Fraud lawsuit in a South Florida District Court, on the basis that the Judiciary cannot make a decision on how a political party conducts its business, even if the party was not neutral in how it ran its elections and was wrong in going against its own charter. Aug. 25: The arrival of the catastrophic Category 4 Hurricane Harvey in southeast Texas, affecting over six million people in Houston and beyond. Flooding of historic proportions occurred over many days. Aug. 26 : Floyd Mayweather/Conor McGregor boxing match in Las Vegas, Nevada, a massive billion dollar public spectacle, with a $100 million prize to the winner. Unmemorable sportswise but unprecedented in $$ generated. Shortly thereafter, on Aug. 29, North Korea fired a ballistic missile over Japan, causing great alarm across the region and the world, the same day the U.S. successfully launched a new nuclear bomb – the modernized B61-12 gravity thermonuclear bomb. The major MSM news focus was on North Korea, and whether it will target the U.S. territory of Guam, as they have threatened to do. In the USA chart, natal Mercury and Rahu reside in Cancer in the 8th house, where the unseen hand of media activities (Mercury) is often not fully understood by the larger public, and where they can be amplified (Rahu), making them even more powerful. This has become even more notable with media conglomerates (increasing since the early 1980s), and only six major corporations now owning 90% of the U.S. media. Whatever message they want to focus on is likely to dominate the media and influence the public, despite the burgeoning of independent media and the new crop of citizen journalists, who are generally less partisan and more focused on rectifying corruption that exists in both parties and elsewhere across the country, and often expanding across the globe. Gemini-Sagittarius is a featured axis in the USA chart, with a Sagittarius Ascendant and four planets in Gemini, including the Sun, with current Dasha lord Rahu in the 8th house (Cancer) with Mercury, as mentioned, putting the spotlight on the media’s unseen role and/or unknown sources of information control, including surveillance. USA’s 18-year Rahu Dasha began Sept. 28, 2015, when U.S. budgets and programs for domestic surveillance were breaking unprecedented parameters, all in the name of national security. President Obama expanded the surveillance programs initiated by President George W. Bush in 2001; and we have discussed how he used them against Donald Trump, among others, and without suffering any apparent repercussions. In such a way we normalize invasive surveillance on many levels in the U.S. and elsewhere. If that were not enough to stir up a cauldron of long pent-up emotions, we had the start of the close (3° orb) Pluto opposition to the USA Sun (22:38 Gemini) within 3° for the first time in its 248.4 year orbit, as discussed earlier, and the first time in U.S. history. This began with a Pluto Stationary Retrograde (SR) on April 17, 2015 at 21:29 Sagittarius (5 ½ months prior to the start of the USA Rahu Dasha), a Pluto SR April 18, 2016 at 23:24 Sagittarius, and a Pluto Stationary Direct (SD) Sept. 9, 2016 at 20:51 Sagittarius. No wonder the 2016 U.S. Presidential Primary season and election were more dramatic than most, with the added Plutonian component of underhandedness. Not only were Democrats accusing Trump of colluding with the Russians, but claims of election theft and fraud were also made against the Democratic National Committee (DNC), in collusion with the Clinton campaign and the liberal mainstream media (MSM). Some of this was documented in the emails made public by Wikileaks from July 2016 onward, while other evidence has been compiled for various DNC Fraud lawsuits. But counter-claims by Democrats of Russian election interference monopolized the mainstream media message, with MSM having the largest control over that. So we have a nation still embattled over the 2016 election results, and planetary patterns indicating that whoever was elected in Nov. 2016 would face fierce opposition. An eclipse path across a nation is not always a pronouncement of a national divide. But the one on Aug. 21, 2017 may be telling us that unless we find a way of talking with each other with full respect for the other’s opinion, the Great National Divide may continue for some considerable time, or at least through 2020, echoing the fierce divide and polarization of Americans during the U.S. Civil War era. Neither major U.S. political party is currently trusted to come through for its constituents, certainly not the Democratic Party – which has shown its true colors in the 2016 primaries and election. In the court case dismissed on Aug. 25, 2017, defense lawyer for the Democratic National Committee (DNC), Bruce Spiva, argued that the Democratic Party has no obligation to be neutral, and that it can favor whichever candidate it prefers, even while claiming to conduct free and fair elections. The plaintiff lawyers (Jared & Elizabeth Beck) still believe that the 120 Bernie Sanders donors who form the class action lawsuit have “legal standing” – based on a Supreme Court precedent in a charity case where donors were seen to be defrauded because they gave money to charities based on false representation. This 14-month long case is not likely to end here, even if it was dismissed in South Florida. [ii] A decision made during Mercury Retrograde can be reversed and/or move into deeper waters. Further, on Aug. 25th Mercury has added power being near the degree of the Total Solar eclipse Aug. 21, 2017 at 4:46 Leo, along with tr. Sun. Also on Aug. 25, 2017, three classic malefic planets were gandanta in water signs: Mars, Rahu and Saturn. Tr. Saturn in gandanta Scorpio had particular power as it had just turned Stationary Direct earlier that day (6:59 am EDT), and whatever gandanta Scorpio brings is not how it first appears. Tr. Saturn also tends to bring its full effects towards the end of a sign, and its final exit from Scorpio is Oct. 26, 2017. With Saturn being the planet of Truth and Scorpio the sign of secrets, we may see some major secrets revealed, echoing the effects of tr. Pluto opposite the USA Sun. Tr. Saturn’s nakshatra lord is Mercury, and its sign ruler is Mars, also gandanta (in Cancer) with Rahu, and also in Mercury’s nakshatra. This gives Mercury retrograde a strong message here, emotionally charged with the three classic malefic planets not only in the water signs, but gandanta – treacherous and unpredictable, as we have seen with the ever-rising flood waters in Texas, as well as in Southeast Asia and Sierra Leone in Africa. [i] The Charlottesville, VA firestorm in Aug. 2017 took place close to Monticello, the historic and iconic mansion with its once extensive slave quarters, owned by Thomas Jefferson, 1743-1826. Founding father, author of the Declaration of Independence, and U.S. President, 1801-1809, Jefferson founded the University of Virginia in 1819. UVA is the first and only U.S. collegiate World Heritage site acknowledged by UNESCO, along with Monticello, another UNESCO World Heritage site. Its college campus is one of the most beautiful in the country, and despite the 100% conscription rate in the South during the American Civil War, it was kept open throughout the war. [ii] Among the many controversies and implications of this DNC fraud case are these: 1) The plaintiff lawyers Jared & Elizabeth Beck received numerous threats, and on June 13, 2017 sought Court-ordered protection for themselves, their families, their counsel and counsel’s employees, and potential witnesses in this case. 2) The process server Shawn Lucas, age 38, died Aug. 2, 2016 of a complex drug combination, though he was not known to be a drug user. This was a month after serving papers to the DNC headquarters on July 3, 2016. 3) Lucas’s friend and fellow DNC staffer Seth Rich, age 27, was killed July 10, 2016. He was a key witness in the DNC fraud case, and spoke by phone with vote fraud lawyer Bob Fitrakis shortly before his demise. This murder case was never solved, and neither a death certificate nor an autopsy report was ever produced. MSM labels any discussion of the case as “conspiracy theory” and shuts it down. http://mason.gmu.edu/~zschrag/hist120spring05/lincoln_ottawa.htm Excerpt from Abraham Lincoln’s first debate with Stephen Douglas, Aug. 21, 1858, Ottawa, Illinois. http://www.salon.com/2017/08/15/what-if-the-dnc-russian-hack-was-really-a-leak-after-all-a-new-report-raises-questions-media-and-democrats-would-rather-ignore/ The VIPS (Veteran Intelligence Professionals for Sanity) explain in technological terms why the Russian hack story has no real basis. https://www.youtube.com/watch?v=T070Z-zGNlE&index=1&list=UU8Cl9QaRtuW9CNjP7pP4BBQ Aug. 22, 2017 : Citizen journalists Jason Goodman & Trish Negron are interviewed by Evelyn Pringle. Excellent summary of the breaking story of the Awan brothers’ criminal operations, and one NOT covered as yet in mainstream news. http://• https://www.youtube.com/watch?v=0krEM2Fy970 Aug. 31, 2017 : Jason Goodman & George Webb at the National Press Club discuss the pending prosecution of Imran Awan. This article also appears in the Sept. 2017 issue of Astrologic magazine, an on-line magazine.